Cameron's trying to get over the loss of his loved ones but it's hard when the people you care about keep dying...first it was his parents, then his boyfriend and now his friends seem to be falling victim to this mysterious curse that's following him. Pete Minchelli is recovering from an injury sustained during his job so he's come to visit his family and friends as he heals and begins to consider his growing discontent with the direction his life has been going in. When Pete's friend,Will Carson, from his academy days ask for help with a case that brings Cameron into his life. Ultimately Pete's confusion over things is only compounded. he's quickly beginning to realize is was even more less than ideal than he had ever thought it could be...as an ever increasing number of lies and deceptions are revealed. As the number of lies and deceptions his relationship was based on increases, so do the number of bodies. It begins to seem like there's one secret that someone's willing to do anything to hide...leaving everyone wondering if anyone is safe from Cameron's stalker...even Cameron himself. There was a lot about this story that I really enjoyed but unfortunately for me there was one thing that really detracted from it and that was the fact that I figured out who the stalker was far to early. While this doesn't always bother me in this case the story was too dependent on the mystery aspect of things and I really needed for the story to have kept me guessing longer than it did. I liked both of the MCs and as a couple, for me, they worked. Next add in some interesting secondary characters and this should have worked better than it did. However, even though I was able to figure out the mystery part of it earlier than I would have liked and for me that did take away from my over all enjoyment of things I also think the fact that I still gave this 3.5 stars speaks to the fact that there is still a good and enjoyable story here. Now at this point your probably thinking 'who the hell is Darcy?' or maybe even 'Is there a Darcy?' well I will tell you there is a 'Darcy' in this story but what I'm not going to tell you is who they are or what role they play. So if you're curious about Darcy you'll need to either read the story or listen to the audio narrated by Brock Hatton. As well as my first time with this author 'No Tears for Darcy' was also my first audio experience with Brock Hatton and it appears to be this narrator's first audio narration. I have to say I was suitably impressed and look forward to seeing what future efforts will produce. I think my only real concern with this book from an audio perspective was that at times, mostly at the beginning of a chapter, it felt like the narrator was reading a little fast almost like his voice was in a race with a stop watch. This was not a really big variance and honestly some people may not even notice it, nor was it consistent which is probably why I did notice it because as the narrator progressed in the reading his voice seemed to level out into a slower more natural rhythm that combined with the individual voices and their expressiveness that I quite enjoyed. While I was definitely impressed with this first time effort, I'm also looking forward to following this narrator and seeing how he progresses and what future narrations his talents will enhance. The ending for this story is more of an HFN (Happy For Now) with strong potential for an HEA (Happily Ever After) and while I would have preferred a more solid HEA I can see it happening based on where this story leaves us but I can't say I wouldn't be interested in reading a little more about Cameron and Pete and finding out just what else might happen on their way to happily ever after. 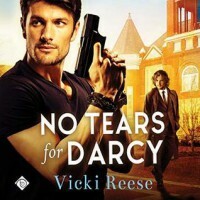 An audio book for "No Tears For Darcy" was graciously provided by the publisher in exchange for an honest review.